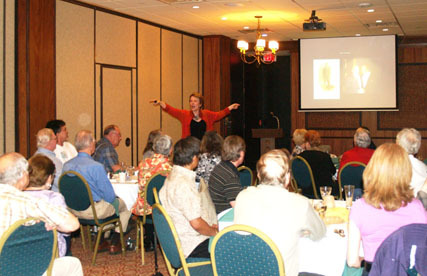 The West Texas Historical Association's 89th annual meeting was held on March 30-31, 2012, in Alpine, Texas. All sessions were held in the Morgan University Center on the Sul Ross State University campus. The Early bird Marfa Tour from 2:30-5:30 pm included Hanger 98, The Paisano Hotel and the Chinati Foundation - van transportation provided. The Early Bird reception was held at 6:30 pm, followed by supper at Mando's Restaurant & Bar at 1506 W San Antonio Street. Later, refreshments and snacks were available at the Marfa Lights Overlook at 8:30 pm. Registration from 1:00 - 5:00 p.m. in the main area of the Morgan University Center. Silent Auction from 8:00 a.m. - 5:00 p.m. in the mezzanine of the Morgan University Center. President’s Reception - from 6:00-7:00 p.m. - the Alpine Country Club, 1601 N Loop Rd. WTHA Banquet from 7:00-8:30 p.m. - the Alpine Country Club, 1601 N Loop Rd. The evening program featured speaker Alwyn Barr giving his presentation on "Black Cowboys: Background and Roles in Texas. 1 “Hot Reactor”: A Drama with Comedic Elements and Action Based on True Recent History and the International Oil Crisis, Cynthia Buchanan, Comadre Productions, Uvalde. Lunch break from 11:15-1:00 a.m. In celebration of the 125th anniversary of Brewster County's founding, residents of Brewster County extended an invitation to attendees of the West Texas Historical Association meeting to stop by the Courthouse between 10:30 to 12:30 to enjoy presentations about the County’s history followed by a barbeque lunch. 3 Caught Between the Crossfire: Refugees of the Mexican Revolution, Nicholas Villanueva, Vanderbuilt University. 2011 Fellow, Excellence in West Texas History Program. WTHA Board Meeting from 7:30 - 9:00 am in the Morgan University Center at Sul Ross State University. Tours of the Fort Davis Area, Prude Ranch Buffet and the McDonald Observatory Star Party, from 2:30-11:00 p.m. Van transportation available via registration. 2 A Scourge and a Hardy Frontier: Anglo-Americans, Indians, and Mexicans in Texas, 1870-1874, Catharine R. Franklin, Hyattsville, MD. 2011 Fellow, Excellence in West Texas History Program. The Saturday afternoon program started at 2:30 p.m. with a tour of the Fort Davis, Texas, included a buffet lunch at the Prude Ranch, and concluded with an Observatory Program and Star Party. 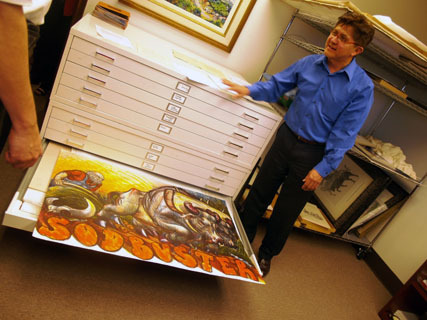 Arturo Flores showing a Luis Jimenez work titled "Sod Buster" to WTHA members who participated in a tour of El Paso before the 2012 WTHA annual meeting in Alpine. Photograph taken by Holle Humphries. Adair Margo speaking to WTHA members at the El Paso Club dinner. Photograph taken by Holle Humphries. Photograph taken by Holle Humphries. Troy Ainsworth chats with the group about background on the Equestrian sculpture by John Houser. Photograph taken by Holle Humphries. Photograph taken by Holle Humphries. 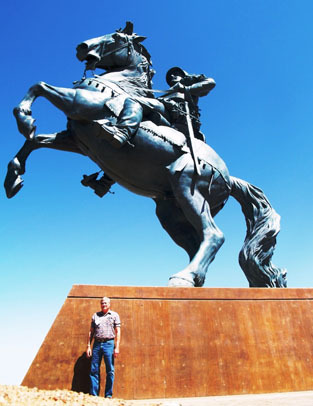 Elvis Allen standing in front of Houser's Equestrian sculpture gives an idea as to the scale of the large art work. Photograph taken by Holle Humphries. 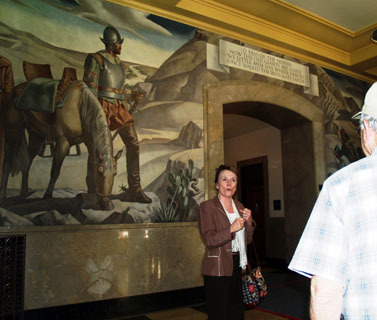 Adair Margo leading a tour about Tom Lea's Pass of the North mural in the Federal Courthouse in El Paso, Texas. 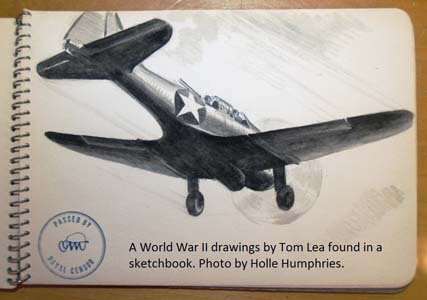 More about the mural can be found on Tom Lea's website. Photograph taken by Holle Humphries. 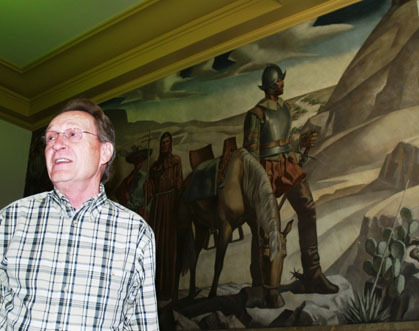 J. Tillapaugh next to one section of Lea's mural. Photograph taken by Holle Humphries. 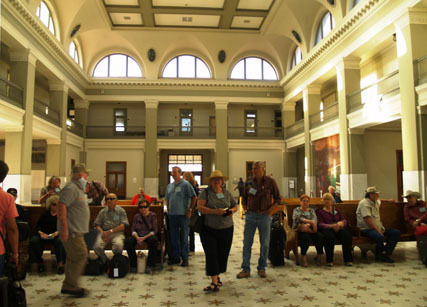 WTHA members waiting inside the El Paso Union Depot for the train to Alpine for the start of the annual meeting. Photograph taken by Holle Humphries. 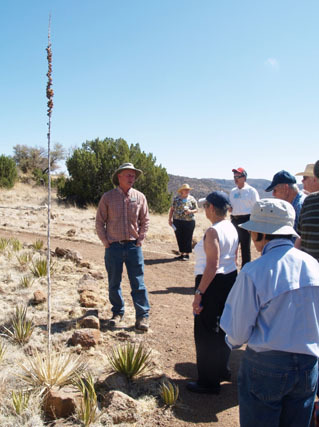 Mark Foreman conducting a tour with WTHA members of the Chihuahuan Desert Research Institute located four miles south of Fort Davis, Texas. Photograph taken by Holle Humphries.